First of all an example dataset, both a picture and the R code to generate it. Here, X1 represents the ID of the individual / observation, X2 some factor1 and X3 some factor2. If I would construct a linear model from this, my linear model in R (using lm()) will think I have 10 observations, while in fact I have 9. 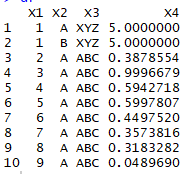 As you can see, the first two lines belong to observation/individual 1, but because this individual has two values for factor X2, it is shown twice in my dataset. In my reallife dataset I have a lot of these cases. My dataset has 4.500 (4.5K) observations, and has a length of 60K+ because an individual can have multiple values for the same factor (for every factor in my dataset). How can I let my linear model in R know that the first two lines are from the same observation? Is it through weights, or should I not use OLS to begin with? EDIT In my real situation I have historical sales data (time series) for many products. To make predictions about these sales, I employed some time-series methods (e.g. exponential smoothing, ARIMA). Furthermore, I need to make predictions about sales for other products for which I do not have historical sales data. These are new products and I'd like to make an estimation about their sales, based on the products that do have sales data. In addition to having sales data, for each product I have product information at a more detailed level: all factors (e.g., color of the product, design, ...). The problem I have is that the weekly sales are on a less detailed product level (e.g., sales of a t-shirt in multiple colors, designs, ...). My idea was to make a linear model using OLS, for which I use the average weekly sales as response (X4 here) in function of product information (X2 and X3). Then I would like to use this model and make predictions for new products for which I have such production information like X2 and X3. The problem (if it is a problem) is that I now have observations/products in my dataset more than once, due to the product information being on a more detailed level (e.g., the t-shirt in colors blue and red). You should not be using OLS if you plan to do any statistical inference. OLS assumes independent observations, which you obviously don't have if the same person appears in your dataset twice. You should look into random effects or mixed effects models. Other models might be appropriate too, depending on the distribution of your response variable. If all you plan to do is make predictions, you could simply fit your model with some randomly selected training data, and then validate your model on a separate validation dataset. The model that has the smallest mean squared predicted error (or whatever error criteria you want to use) should be used. I don't think you'd need to concern yourself with weighting -- at least not to arrive at proper variance estimates/standard errors (that's not to say modifying weights may help you obtain better predictions). Not the answer you're looking for? Browse other questions tagged r regression time-series multiple-regression least-squares or ask your own question. How to compare model fit of OLS and Poisson regression? Multiple linear regression: observations with 2 or more values per factor / categories - a problem?